A continuación se presenta un registro de las especies descritas y nuevos registros para Colombia. Grant, T, M. Rada, M. Anganoy-Criollo, A. Batista, P. H. Dias,A. M. Jeckel, D. J. Machado, J. V. Rueda-Almonacid, 2017.Phylogenetic Systematics of Dart-Poison Frogs and their Relatives Revisited (Anura: Dendrobatoidea).South American Journal of Herpetology, 12(Special Issue 1), 2017, S1–S90. Rivera-Correa M., C. Jiménez-Rivillas & J. M. Daza. 2017. Phylogenetic Analysis of the Neotropical Pristimantis leptolophus species Group (Anura: Craugastoridae): Molecular Approach and Description of A New Polymorphic Species. Zootaxa. 4242(2):313–343. Rivera-Correa, M. & J.M. Daza. En prensa. Molecular phylogenetics of the Pristimanstis lacrimosus species group (Anura: Craugastoridae) with the description of a new species from Colombia. Acta Herpetologica 11(1): 31-45. Grant T. & C.W. Myers. 2013 Review of the Frog Genus Silverstoneia,with Descriptions of Five New Speciesfrom the Colombian Chocó Dendrobatidae: Colostethinae).American Museum Novitates (3784):1-58. Rivera Correa M. & J. Faivovich.2013 A New Species of Hyloscirtus (ANURA: HYLIDAE) from Colombia, with a rediagnosis of Hyloscirtus larinopygion (Duellman, 1973).Herpetologica, 69(3), 2013, 298–313. Mueses-Cisneros JJ, I.V.Perdomo-Castillo & B. Cepeda-Quilindo 2013 A new species of the genus Pristimantis (Anura: Craugastoridae) from southwestern Colombia. Herpetotropicos 9: 37-45. Rivera-Correa M., & V.G.D. Orrico 2013 Description and phylogenetic relationships of a new species of treefrog of the Dendropsophus leucophyllatus group (Anura: Hylidae) from Amazon basin of Colombia and with an exceptional color pattern. Zootaxa 3680: 447-460. Sánchez D.A. 2013 Larval morphology of Dart-Poison Frogs (Anura: Dendrobatoidea: Aromobatidae and Dendrobatidae).Zootaxa 3637 (5): 569–591. Amézquita A, Marquez R, Medina R, Mejia-Vargas D, Kahn TR, Suarez & Mazariegos L. 2013 A new species of Andean poison frog, Andinobates (Anura: Dendrobatidae) from the northwestern Andes of Colombia. Zootaxa 1620: 163-178. Guarnizo C. E., C, Escallón, D, Cannatella & A. Amézquita 2012.Congruence Between Acoustic Traits and Genealogical History Reveals a New Species of Dendropsophus (Anura: Hylidae) in the High Andes of Colombia. Herpetologica.68(4):523-540. Rivera-Correa, M. & Gutiérrez-Cárdenas, P.D.A. 2012. 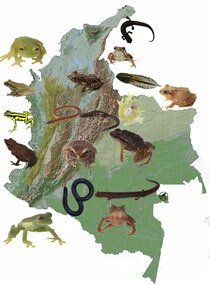 A new highland species of treefrog of the Dendropsophus columbianus group (Anura: Hylidae) from the Andes of Colombia. Zootaxa 3486: 50-62. Mueses-Cisneros, J. J., D. F. Cisneros-Heredia, & R. W. McDiarmid . 2012. A new Amazonian species of Rhaebo (Anura: Bufonidae) with comments on Rhaebo glaberrimus (Gunther, 1869) and Rhaebo guttatus (Schneider, 1799). Zootaxa 3447: 22-40. Acosta-Galvis A. R. & Gutierrez-Lamus, D. L. 2012. A new species of salamander (Bolitoglossa: Plethodontidae) from the Cordillera Oriental of the Colombian Andes. Papéis Avulsos de Zoologia. 52(18):201-218.